Wowee where do we start. These last few weeks have been overwhelming to say the least and I’m so incredibly grateful for the opportunities that have come my way. Firstly thank you to everyone that watched my Draw my Life video. The support from doing that has been beyond anything I could of ever expected.Thank you to the wonderful Matt who recently featured me on his blog survivingmypast.net and also a huge thank you to the University of Cambridge for providing me with the OCD questionnaire that I posted and for those who took time to complete it.I honestly cannot explain the feeling of getting an email from a place like the University of Cambridge and being given an opportunity to help in any sort of research to OCD. What a quick and ever so smooth way of getting into the next bit of my blog post. Today is another very special post (I know right, make it stop!) as today i am talking to you about a very special little app nOCD. If you don’t know what nOCD is its a mobile treatment app for yep you’ve guessed it,OCD! Now I remember when this app was only an idea and even saw the advertisements for the funding of it. Since 2016 and the app’s launch I have only watched this little app and the support for it grow and grow. Lets talk a little more about what it is! nOCD is a smartphone and smartwatch app that provides you with discreet on the go help and support for OCD! The app uses ERP Therapy and provides a digital alternative to the traditional methods and creates an easy and comfortable option for those wanting to tackle their OCD head on. What on earth is ERP? Exposure Response Prevention Therapy (ERP Therapy) is a type of Cognitive Behavioral Therapy. It is a wonder for OCD as it involves the person with OCD facing fears head on and learning to deal with and refrain from ritualising. nOCD allows you to create ERP plans and set reminders to point out key times to start treatment. It also allows you to log and keep track of your recovery and also provides you with information about your day which includes letting you know when and where you’re having triggering episodes, how often you’re doing your homework and what you’ve been working on. One of the crucial things about this app is that it was created by OCD patients for OCD patients. The team includes specialist OCD advisers, clinical researchers and we can’t forget Bob! nOCD also comes with a handy little buddy by the name of Bob to encourage and let you know you’re not alone during the whole process! One of the key features in this little app i feel is the ability to log information. During my own therapy me and my therapist tried to log as much information as we could about my progress. I felt it a key part of my recovery but its not easy to keep track of everything and write it down. To have something personal to keep all these important pockets of information and to have it in the platform of an app makes it current and an easy ‘go to’ option. It is important to remind yourself of where you’re at, what you struggle with and how far everything is coming along and nOCD is a great way to view and keep track of that. This app is truly a game changer and has created a new field in the self help world. I can connect and see it sharing so much important information and key points that I learnt through my own recovery. It uses the same language and same techniques that I did during therapy.Though nOCD recommends using the app with the help of a therapist those with ERP knowledge can use the app alone. I would highly recommend checking this app out and having a little play around with it. If you find you do not understand parts of it or the language I would recommend going to your GP and talking about therapy and its options. If you are already in therapy I would recommened telling your therapist you are using nOCD just so they know you are engaging in other forms of help incase you are being taught or given two sets of different information. nOCD is great to add into your therapy sessions and therapist all round the world are already backing this little app! The wonderful team at nOCD have created a direct link for you to access the app. 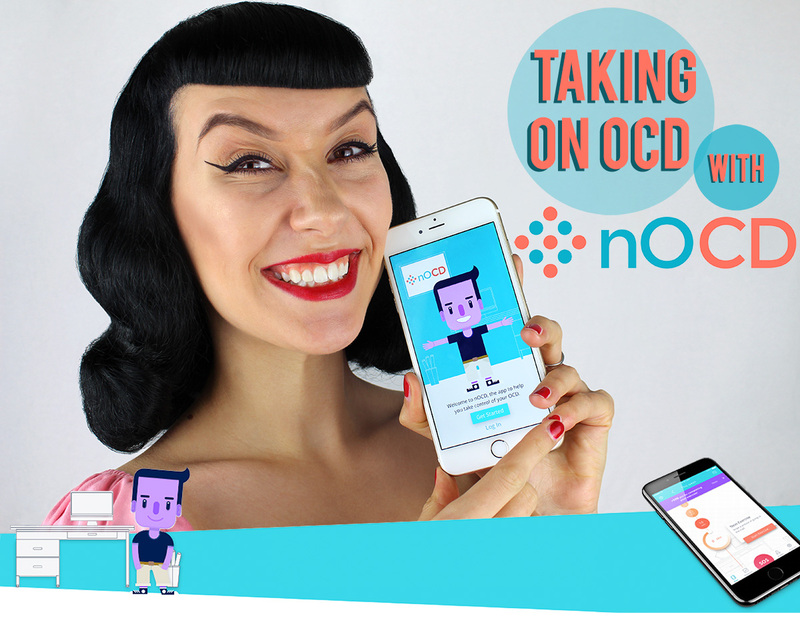 Thank you not only to nOCD for supporting me with this post but for also creating such a wonderful app for those suffering with OCD. My blog is a safe haven and I would never put anything on here that I don’t truly believe in and thats why this app is safely here. If anyone needs any more information about the app itself or any other details please contact myself or the team at nOCD who will be happy to assist. I truly believe OCD is manageable and I believe in every single one of you.